Pantone Challenge 2017 – Something Greenery for St. Patrick’s Day? Remember that fashion for lime-green a while back? That stuff was EVERYwhere! Now that trends have moved on, it’s pretty common to find unloved lime-green apparel on the racks of many a charity shop round about. Some of it is really nice quality linen, and I have been diligently collecting such items whenever I have encountered them for… hmm, several years now! Charity shops are great places to “mine” for interesting specialty or luxury fabrics if you don’t mind doing a bit of rummaging and can adopt a “work with what you can find” attitude to the process. Originally I started collecting old ties and other 100% silk items from charity shops and have amassed quite a collection of gorgeously coloured and patterned silks that I would have struggled to assemble from “regular” fabric shops. Some of my silk ties were recently showcased in a EPP hexagons project with a bit of a difference. 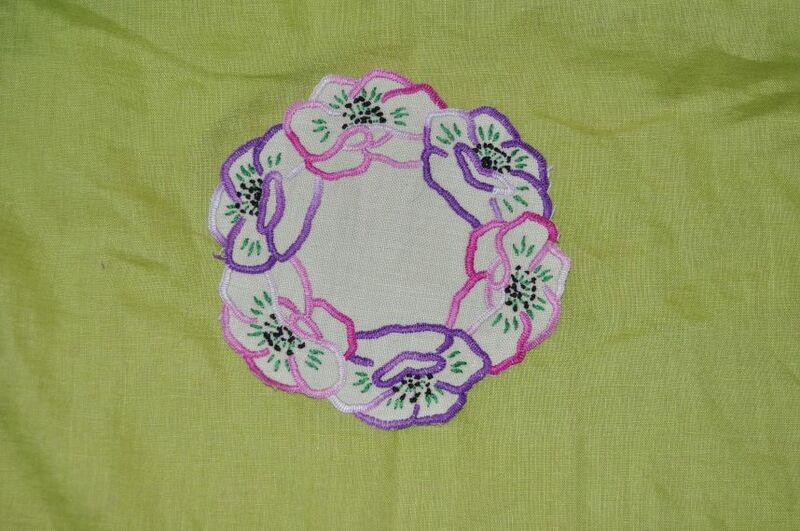 Something else you may find in charity shops is hand-embroidered linens, and here began my linen-hunting journey. 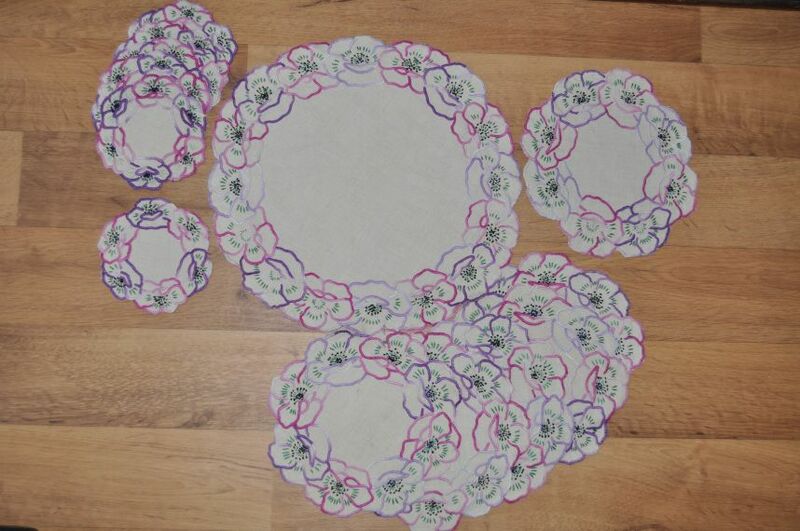 During a routine tie-hunting mission in the Tenovus shop in Haverfordwest several years ago, the lady behind the counter drew my attention to a set of circular table mats in several different sizes – six small, six middling and one large, just right for a very decorous tea party – with an attractive pink-and-purple pansy-ish design. I looked a lil closer. They were not machine-embroidered. The back of machine embroidery doesn’t look like that! 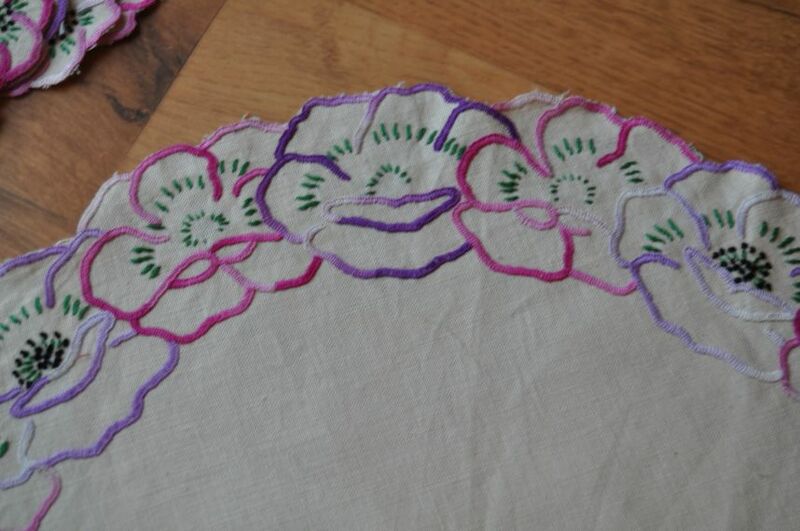 Not to mention, the Mystery Embroiderer who made these mats has missed little areas – the curve of a pansy petal left not quite finished, the curious absence of clusters of French knots. Did she miss these bits by accident? Run out of floss or time? Get bored and just want finished? We’ll likely never know! Given the cracking deal I was getting on all the ties I’d found in the shop, I figured that a tenner for the mats wasn’t bad going and so they came home with me. I’m not a huge collector of embroidered pieces but these were rather appealing. But what to do with them? The obvious idea, given my growing interest in patchwork and quilting, was to use them as appliqued elements in a quilt, but the linen ground fabric looked “wrong” on the quilting-weight cottons I sat them on and the local fabric shop’s linen offerings weren’t much better, being quite a coarser weave and in not terribly attractive colours. Back to the charity shops, then! 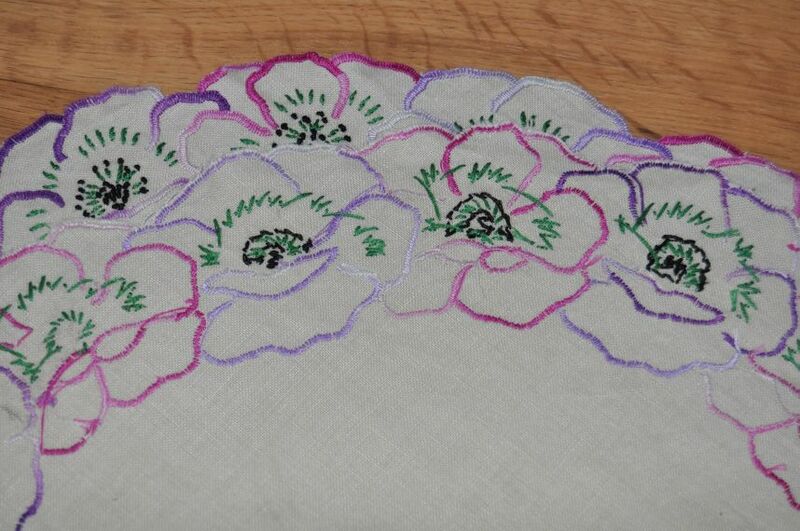 The linen used in clothes is usually a fairly fine, nice quality and I decided it would be quite fitting to applique my charity-shop embroidered mats to charity-shop linen patchwork. 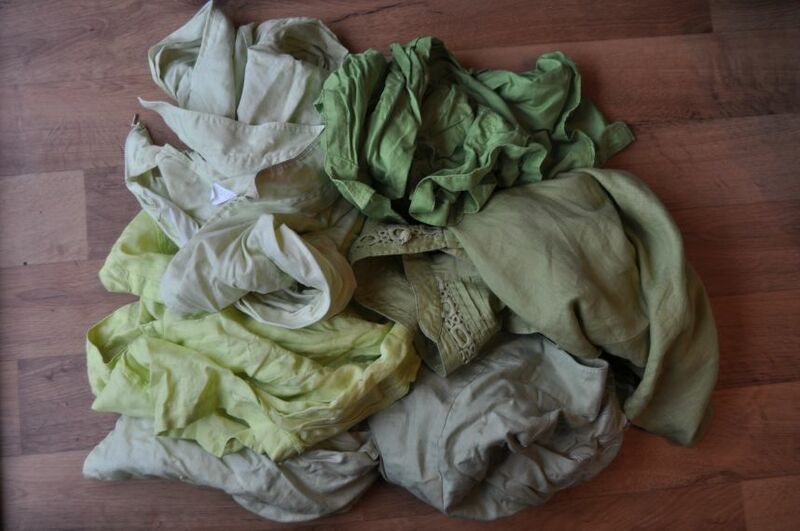 One smaller mat lived permanently folded up in my handbag so that I could pull it out and “sit” it on any potential candidates and gradually my collection of green linen grew. 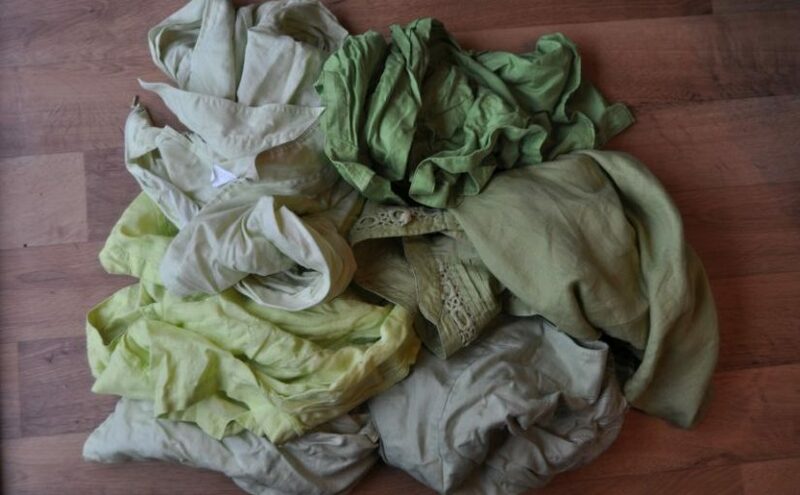 I did once try buying a couple of things from Ebay, but the colour matching was horrible and something advertised as 100% linen proved to be a linen/viscose mix – not what I wanted at all! To date, this has been a real back-burner project, rumbling on gradually as I’ve slowly collected resources for it. The clothes have been washed as I collected them (some of them more than once after an Unfortunate Coffee Incident…), but not taken apart because I was afraid of it all shredding before I could do anything sensible with it – piecing the body of the top is definitely an “in one fell swoop” task, I feel. I confess, it’s taken a lot of hunting to find those linen garments! Feels like charity shops have taken over a lot of high streets round here, I figured I could make use of that. Some are definitely better than others for patchwork “finds”, though. I usually find it worth a little poke through the men’s ties (if there are any) because I like the silks you can get that way – although these days I am quite choosy about what I buy and what I’m willing to pay!